Gilbert felt sad leaving his old boots behind. He’d had them for so many years, that they were more duct tape now than plastic and rubber. He wore them that winter he was sleeping in an abandoned car behind Miller’s warehouse. Old Man Frank had turned him on to that one. Hit by a truck crossing the street one night. That was no way to die. Now Gilbert had new boots, new clothes, and a new place to live, too. Being homeless was rotten, but it was still a life, and amid all the hardship, he’d made some good friends. I wrote this for the Rochelle Wisoff-Fields flash fiction challenge. The idea is to use the image above to create a piece of flash fiction no more than 100 words long. My word count is 100. The boots looked like they belonged to a homeless person, so I went with that. I didn’t have enough room within the 100 word limit to mention the various microhouse project that are springing up in various communities to provide living space for the homeless. Fun fact: My son Michael reminded me that at his High School Senior prom, a couple went dressed in a tuxedo and gown made entirely of duct tape. He still has the photos. Sad story. I imagine it’s not far from truth. Nicely done. At least Gilbert has come out of the other side of homelessness in tact, so many do not. True, Courtney. We need to find better solutions for our homeless population. The “microhouses” project is a good start. Despite the new shoes and new place to live, one still has memories of old boots! Being homeless doesn’t mean you stop living or feeling or that you don’t have strong friendships. Even though not being homeless anymore is a good thing, Gilbert still has cherished memories. Thanks. That’s one of the benefits of writing flash fiction. It hones your skills, teaching you to develop a character in as few words as possible. A nice snap shot of economic transition. Economic and emotional. Thanks, yarnspinnerr. I like your insight into the world of the homeless, and your empathy with Gilbert. I think the duct tape was applied over other material and not directly to their skin. Otherwise, ouch! Occasionally, people in the local homeless community make into the news, so it’s not difficult to put names, faces, and personalities on them. 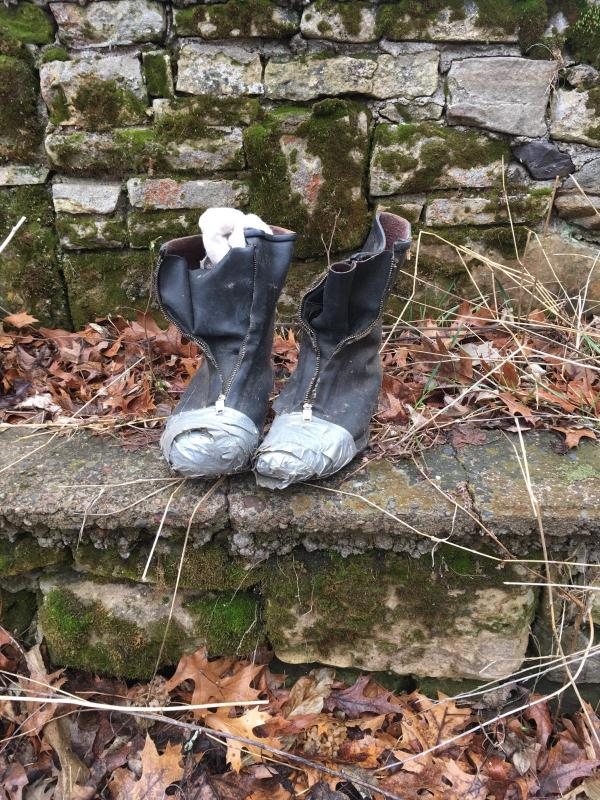 The boots seemed to lend themselves to tales of homelessness. I liked the perspective you’ve shown in this story where his life is not all doom and gloom. Homeless people are usually so invisible, but this man was vividly portrayed. i’ve seen those duct tape clothes – part of a recycling awareness program. They certainly are unique, Alice. Lovely story, James. I wish more of the homeless could end so well. Beautifully written. Seems like Gilbert is one of the lucky ones but those memories will remain with him forever. Sad but not hopeless. He has friends and that’s something money can’t buy. Sad, but he’s making the best of it. No choice, I guess. Not being homeless anymore is supposed to be an improvement, so yes. the luxury of new boots, I expect being down and out is not a choice, but life goes on. A clear observation on society indeed. No matter what you do. if you are living it, it is still a life. You made me like this guy in 100 words…good job! Not every homeless person could adjust to a different life. This is very true, Liz. Some choose the streets rather than submit to the limitations put upon them by authorities at shelters and in other programs. I agree with Dawn. I felt a lot of empathy for your homeless man and now wish him well. I truly believe the homeless often have a network of friends. There are a number of programs in various American cities that are trying new and innovative ways to address their homeless, Dale. Thanks. Gilbert is fortunate to have a new way to live and new boots and everything else. This story seems like it was a lot longer than it is and you sure made the best of every single word! Thanks, Nan. Sometimes things just work out well in these little pieces of flash fiction. A poignant story which turned around for bitter-sweet reasons. Well done.